Sorry for the wait guys, was a bit busy yesterday. 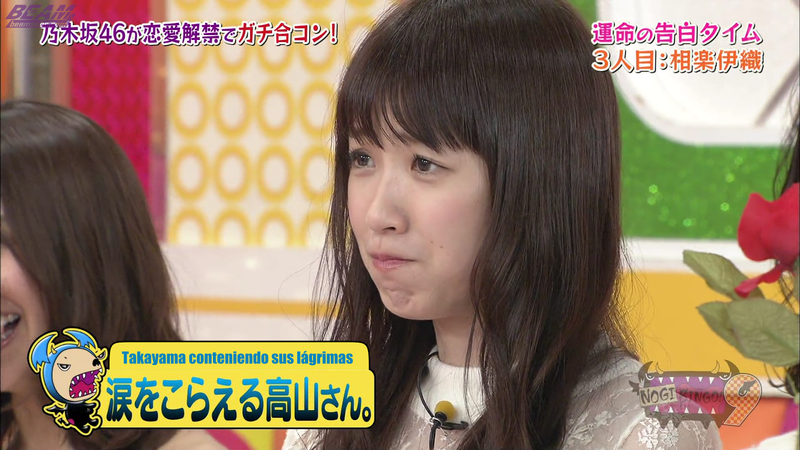 Anyway, in this episode, Nogizaka's dating ban is lifted! The girls will take part in a group blind date with some surprising male candidates! After getting to know each other, the members must confess to the one's that caught their attention! We're trying something new with our hardsubs, it allows us to save time and space. The hardsub file will now contain both subtitle files (English and Spanish) within it. We recommend you use VLC or MPC-HC (both are free and safe) to play the videos, and look for the option that allows you to select the subtitles within the video, and then select the language you wish to view. If you have any questions, feel free to leave a comment. Perdón por la espera, estuve un poco ocupado. Bueno, en este episodio, la prohibición de citas de Nogizaka se levanta! Las chicas participarán en una cita a ciegas con algunos candidatos sorprendentes! ¡Después de conocerse uno a otro, las integrantes deben confesarse a el que mas le llamó la atención! Estamos probando algo nuevo con nuestros videos en descarga, es algo que nos permite ahorrar tiempo y espacio. El video que esta disponible para descargar, ahora contendrá ambos archivos de subtítulos (inglés y español) dentro de él. Les recomendamos que utilicen los programas VLC o MPC-HC (ambos son gratis y seguros) para reproducir los videos, despues busquen la opción que les permite seleccionar los subtitulos que contiene el video, y seleccionen su idioma. Si tienen alguna pregunta, siéntase libre de dejar un comentario. this sub quality is so good ! thanks for spanish subs!!! gracias por los subs en español!! It work's fine for everyone on the team. It's the same one we used for the streaming link on Dailymotion so it's definitely in sync. Huh, that's weird. We honestly don't know what the problem is. So far everyone I've asked has told me the hardsub is completely fine for them. The thing is, the streaming link is perfectly in sync, meaning that the hardsub should be just fine as well since it contain's the exact same files we used for it. For now, I can only suggest three things. 3. Delay the audio so that it matches with the video. For example, on VLC you can Right CLick --> Tools --> Track Synchronization, to adjust the audio. Excited and scared at the same time for the next episode though! Since this is about the 4th person having this problem, we created a poll to see if it's affecting the majority of people, or just a handful. It has been posted on this site, feel free to leave your answer.